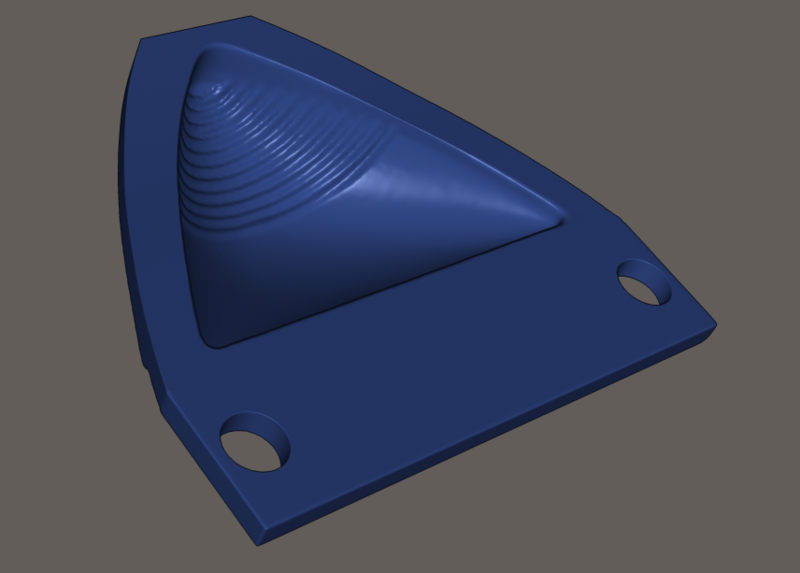 3D Scanning Case Study: Classic car light cover to be 3D scanned and 3D printed for car restoration project. The lens to be 3D scanned is 59x59x15mm and about as small as the Creaform Go!Scan 20 can go. with smaller objects such as this, we sometimes take macro photographs as close-up reference to help with any rebuilding after post-processing. In this instance there was no need to take any macro shots as the 3D scan came out well. High Resolution and accuracy of 0.1mm with this 3D scan meant even the imperfections of the manufactured surface were maintained, which gave opportunity in the final stage to keep as the original or to clean up further and reverse engineer the object (that is to rebuild the object from scratch using the 3D scan as a master). As the bottom part of the lens was missing, we rebuilt the element making sure it would fit the car. The Final Reverse Engineered 3D Model - Ready to output as a 3D print. Apart from the time and cost savings associated with eradicating toolmaking there is also the benefit that the 3d file stores without degredation (all tools & moulds deteriorate). Additionally if it were an asymmetrical design it could be flipped for left/right 3D printing at any point in the future. "This is how business should be; quick to respond to an enquiry, enthusiastic in developing to the final 3D scanned item. Top marks from Chinchilla, totally recommend them."